Despite being a business mentor and wealth coach, one of the greatest differences I know I’ve made to clients over the years is in encouraging them to clear their clutter. And I’m perfect for this because I live such a minimalist and clutter-free life. That comes from the military discipline in my childhood you see, and travelling a lot and moving house all the time. In fact, sometimes I wonder what I have spent all my money on over the years I’ve worked, must be millions now, because it certainly isn’t visible round here. During the summer my niece was having lunch with me in the garden. She had a headache/hangover and asked for an aspirin. I told her to go to the bedroom, to the chest of drawers, and to the top right-hand drawer where I keep all my first aid guff, usually just for my holiday trips. She returned in awe. Wistfully she said she wished she knew where everything was as easily in her own home, that she could put her hand so swiftly on what she needed. Which suprised me somewhat as obviously she’s cut from the same cloth as me, and I know she is obsessive about some things. I forget what, but clearly not clutter. She was especially envious of the place where I keep my cotton buds. I must confess this was a gift, but I have a little plastic sheep and they are all in there. Baa! Anyway, I digress. I was thinking this morning about how clear and creative a couple of my former clients are. I can see this from their websites now. They are powering ahead. But I remember when I worked with them a few years back, they were both mired in the stuff, unable to move, breathe, think or do anything. This was a good lesson for me at the time as it taught me the way other people operate. Initially I simply could not believe that any one human being could have so much stuff that it could take them so long to achieve precisely nothing. But they were achieving something, and something vital at that. They were beginning to clear their clutter. And I came to see it was a metaphor. Their clutter was like a fog which meant they couldn’t see, or even breathe. It was like a weight on their shoulders which meant they couldn’t move. And it felt like something hanging over their head which meant they couldn’t think. HOPELESS if you are trying to kick-start a business and a creative one at that. Both these ladies are very creative indeed, artsy in fact compared to me. I have written to them today to see if I can get updates on how clearing their clutter enabled them to burst forth and make great strides in their respective metiers. If I get any useful tips, I’ll pass them on in a later blog update. “If you’re like most people, you probably have clothes hanging in your wardrobe that have been there for years waiting for you to lose those few kilos so you can fit back into them; or you’ve got boxes of children’s toys that never get used; or maybe you’ve got kitchen appliances that have never been taken out of the box, or a garage full of items, and you don’t even remember what’s there – but you want to keep them, just in case you may want to use them again one day. Sandy recommends a yard sale or boot fair and selling everything you no longer need or want and putting that money into a special savings account. I believe we all have items we can sell, items we can donate and junk which just needs to be recycled or thrown away. Clear everything you can. Get some help if you need it. There are people you can pay to do this with you but obviously the best method is just to swap with a pal – I’ll help you do yours if you’ll help me do mine. Shopping as a leisure pursuit – as some of us have been used to for the last couple of decades – can lead to your house being overstuffed. I recommend watching out so that anytime you bring something into your home, if it isn’t consumable, i.e. you are going to eat, drink or read it within the week, throw something out to make room for it. A new pair of trousers? An old pair has to go. No need to save them “for gardening”! A new book? How about paying forward an old one? Sandy reminds me that “your trash is someone else’s treasure” and that’s true. I have seen much of my stuff go to good homes either via ebay, Freecycle or Gumtree. People come round here and collect stuff I want to be rid of all the time and their surprise, delight and gratitude is my joy. My next goal is to put all my filing online so that I don’t have a garden shed full of lever arch files. So, how will you do it? How will you get rid of stuff so as to be clearer to focus on your goals and more creative in your daily life? Like so many things, don’t wait for the perfect week or weekend to do the whole lot in one fell swoop. Do it today. Start today to begin the process of getting closer to clarity; bin something. Give something away. Why not consider donating one in 4 (or one in 10 if you really can’t bear it) of your books to the charity shop? Think of the pleasure you will afford someone else by making stuff you no longer use available to them at a bargain price. What a joy that we can afford to be abundant in that way. Sandy even recommends looking at big things you only use once a year like a jet ski, a caravan or a boat. Blimey! She’s really good at this. What could you clear today? 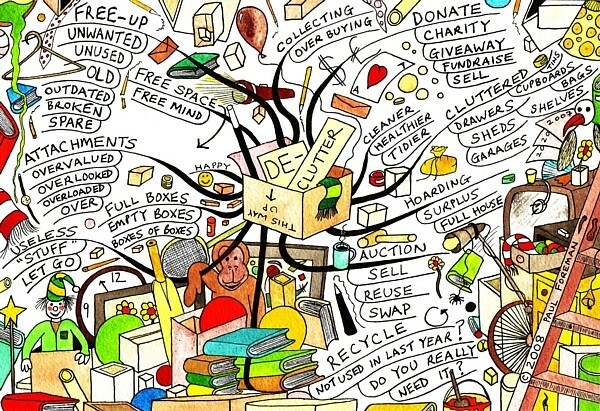 And what stories can you share about the benefits of clearing your clutter? 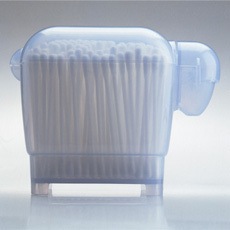 PS Here’s the baa-lamb which holds my cotton buds. Tragic, I know. But a useful gift. If it weren’t a useful gift, it would have been up the charity shop long ago. I’m that brutal. Welcome back Judith-missed ya! Yes,clutter clearing is an ongoing journey. With three daughters and an ex husband on the way out there is lots of clutter clearing to be done. it is a great feeling to see a clear space.Books are my hardest “possessions” to recycle – so a while back I did the count every 4 books to give to charity, some #4s I wasnt ready to release but it is a good way to recycle books.